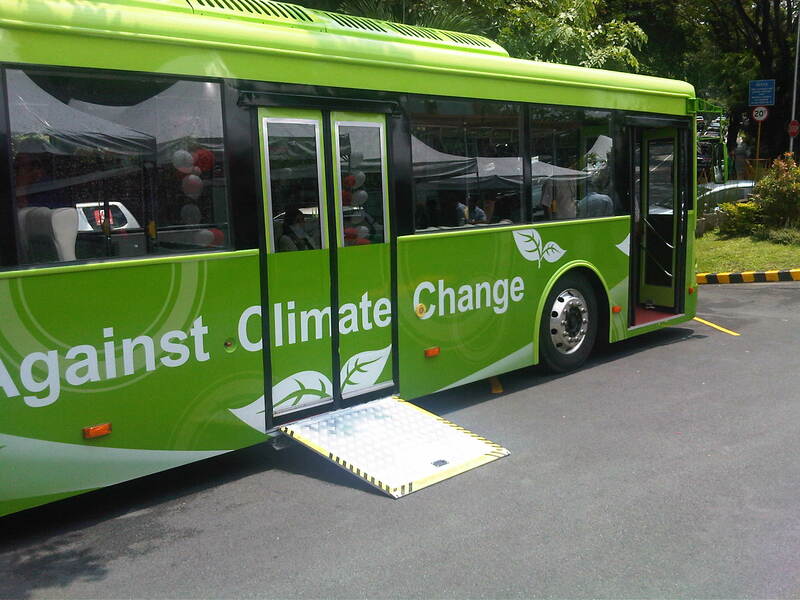 An electric bus was on display at the 2nd Electric Vehicle Summit recently held at the Meralco Multi-purpose Hall. The exterior reminded me of the buses I rode in Yokohama and Saitama during my stints as a student and later as a visiting researcher. Following are a few photos I took of the exterior and interior of the bus. Most of the following notes are comments applicable to city buses operating in the Philippines rather than specifically for electric buses. This electric bus was imported from Taiwan by the Victory Liner Inc.., which is among the largest provincial bus operators in the Philippines. The first thing I noticed is that the bus has a low floor, perhaps the same height as most curbs, but this can be a concern considering many of Metro Manila’s streets are subject to flash floods during the wet season. 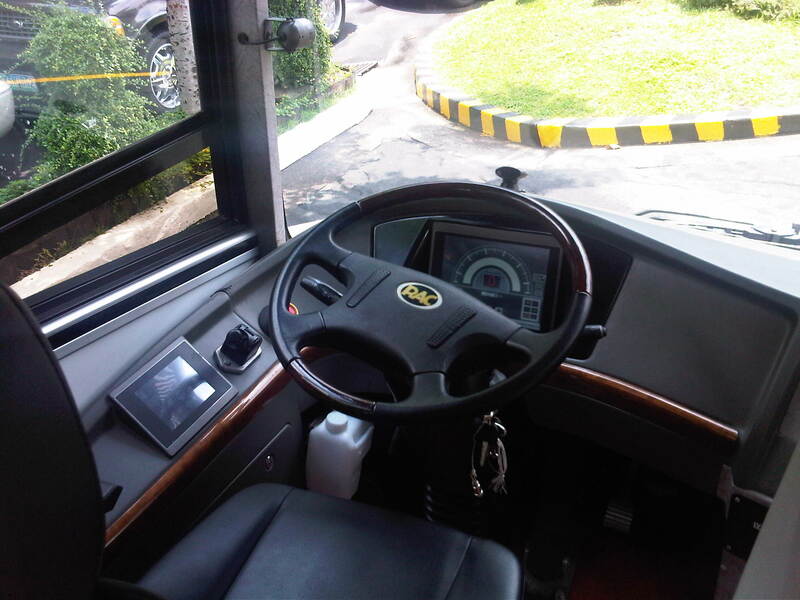 The interior and layout is perhaps the most appropriate for buses with city operations. There is sufficient standing space from the front to the middle of the bus. Seats here are usually for the elderly or physically challenged and includes space for a wheelchair. Most city buses in Metro Manila have layouts that are suitable for long distance trips, with many seats and often narrow corridors. 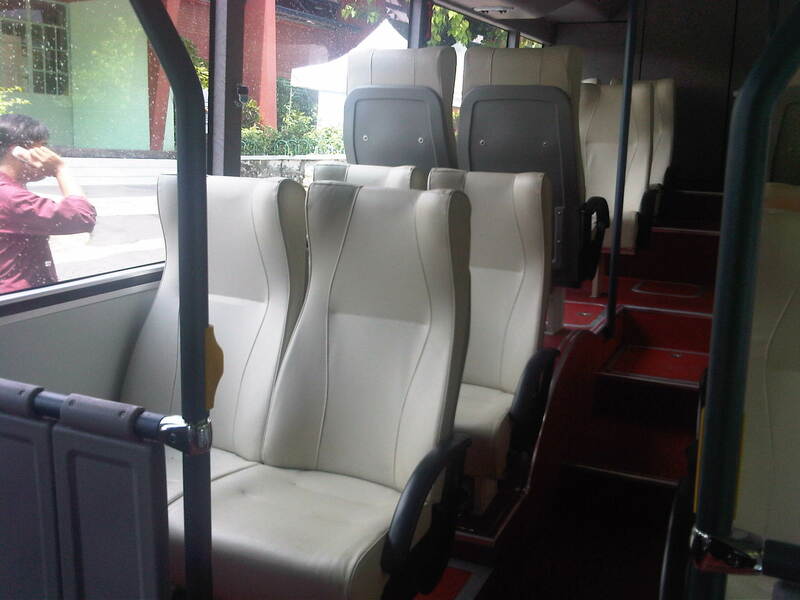 The seats at the back look very inviting and I assume are comfy for long rides not because of distances but congestion. Obviously, these seats and especially those at the back, which require passengers to negotiate a few steps are free for all though those in the lower level may be reserved for the elderly, physically-challenged or pregnant women. A look at the driver’s seat with the emblem of the manufacturer, RAC, on the steering wheel. 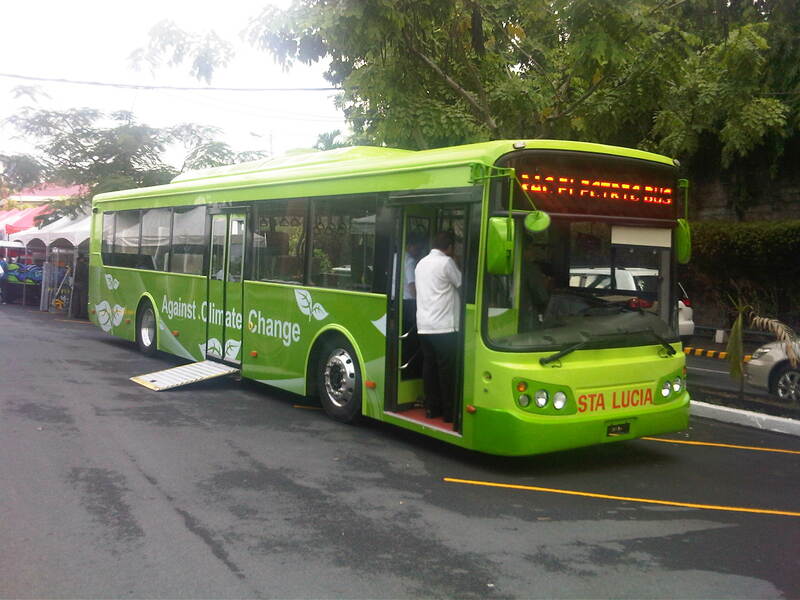 I saw an article on the electric bus stating its specs (top speed of 95 kph and range of 270 km on a single charge). I’m really not worried about the specs given the advances in technology these days. I think it will still boil down to driver behavior when it comes to the question of road safety and the provision of efficient services for the public. Unlike most city buses in the Philippines, this bus has 2 doors. The one at the front may be used for entrance and there’s space for transactions, i.e., payment of fares, showing passes or swiping of cards. The one at the back is wider for more efficient unloading of passengers. There is also a provision for a ramp that can be used by persons on wheelchairs. The potential benefits derived from electric buses are quite obvious from the environmental perspective. I like its chances for success considering that the initiative is being pushed by a major company like Victory, which might have to show the way by being an example and be the first to deploy these buses on an actual route. Victory’s business, however, is in provincial operations so there should be at least one taker from among the companies operating in Metro Manila to use these buses on a route. For demonstration purposes, I think Bonifacio Global City with its Fort Bus service can provide a good route for a start. The Fort is ideal for such electric buses given the current demand and route length. Charging stations may also be provided at the route ends, particularly at the Market! Market! transport terminal. Another option might be Katipunan, with electric buses allowed to enter the Ateneo campus and perhaps help alleviate traffic congestion there by encouraging their students and staff to use public transport. One end may be at the UP Diliman campus where the buses may also be allowed to enter the campus but perhaps take a route that won’t necessarily compete with jeepneys on campus (e.g., Academic Oval). Deciding the other end of the route would be a bit tricky but one option can be near SM Marikina where a secure terminal can be established and sufficient space for “park and ride” or “kiss and ride” operations. These might just be success stories in public transport waiting to happen. 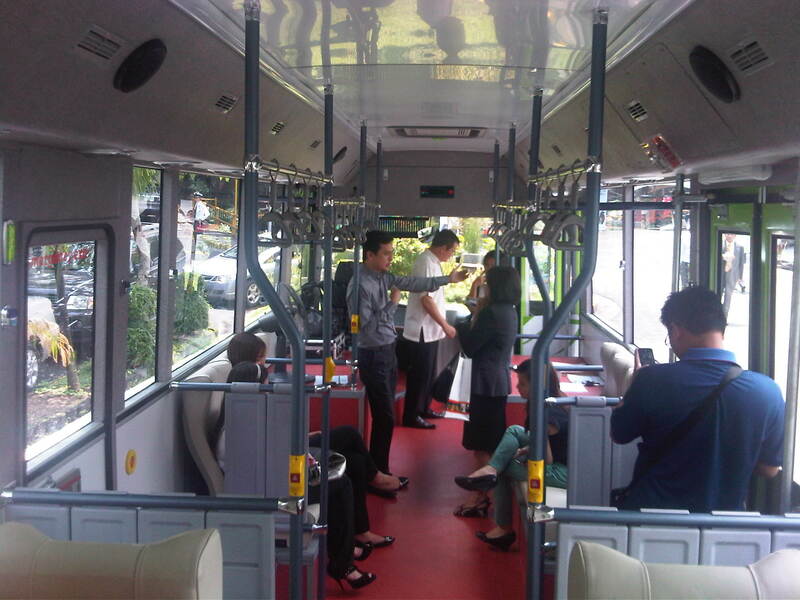 By d0ctrine in Bus, Electric Vehicles, EST, Public Transport on June 9, 2012 . It’s with the Victory Liner group.